We are a dynamic company providing international cargo shipping services. Customer satisfaction has been one of our key goals since the inception of our company on 26 October 2009. Thus our main priority is making sure that all our operations run smoothly and efficiently. This drives us towards our goals and allows us to maintain a solid customer base. We know perfectly well that today customer recommendations are more important than ever. Trustworthiness and a strong sense of responsibility are among the most important values for a logistics company. We can provide guarantees to our customers thanks to our civil liability insurance and CMR insurance. You can rest assured that you will not incur any losses if you choose us. In 2017, we had an annual turnover of 6,000,000 euros and a team of 80 employees. 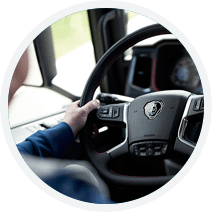 TL Transport has already earned the trust of numerous customers who greatly appreciate our services. Thus we can state with confidence that trustworthiness is the number one reason you should choose us. Contact us today and we will meet and exceed your expectations! 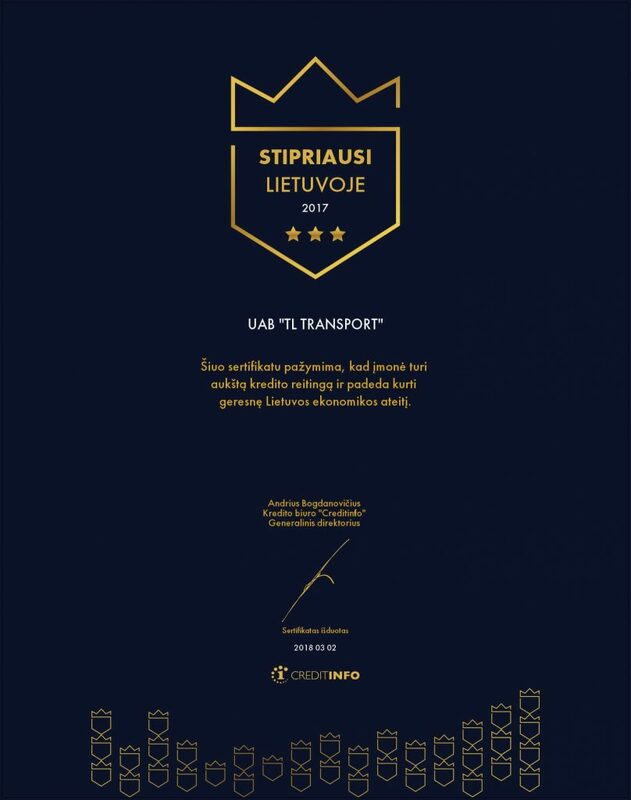 “STRONGEST IN LITHUANIA” is a certificate awarded to financially strong Lithuanian companies and their directors confirming a good credit history of the company and its director. What are the criteria for certifying companies and their directors? The most important assessment criterion for awarding the STRONGEST IN LITHUANIA 2018 and the STRONGEST LEADERS IN LITHUANIA 2018 certificates is a high credit rating which demonstrates a low predicted statistical probability of non-performance for 90 or more days over the coming 12 months. The solvency of companies is assessed and the rating is determined based on their credit history which includes the company’s performance of financial obligations, payment history, financial results and their changes (changes in such indicators as income, profit, liquidity, equity capital, etc.). Account is also taken of business relationships, seizure of property, the situation within the sector and other relevant information. Over 100 different variables are taken into consideration in assessing the credit rating, and each of them has a different impact on the company’s rating. When awarding the STRONGEST LEADERS IN LITHUANIA certificates to the companies, a 5-year credit history is additionally assessed. 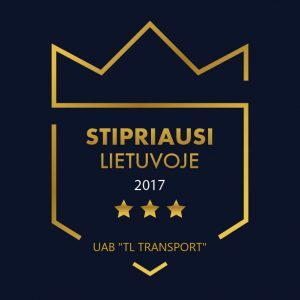 The heads of companies are awarded the STRONGEST LEADERS IN LITHUANIA certificate based on the statistical rating model if the predicted probability of late payment does not exceed 1.7 percent. We are committed to both our customers and employees. We always strive to provide our staff with opportunities for growth. We greatly value employee loyalty and seek to create a work environment that is financially rewarding and promotes self-realization. It is our goal to provide the best possible working environment to our employees so that they are happy being part of our team. 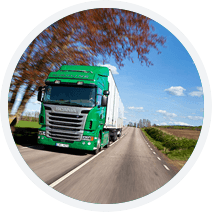 We use satellite-based GPS systems in our shipping operations which allow us to maintain remote contact with our drivers throughout their transit. We can receive accurate information about the vehicle’s location at any time. This allows us to further increase the quality of our services. Extra fast delivery of shipments is one of our strengths. We know perfectly well that customers are not willing to wait long periods for their shipments to be delivered. Today no one can waste their precious time. Speed is among the most valued criteria in the shipping industry. 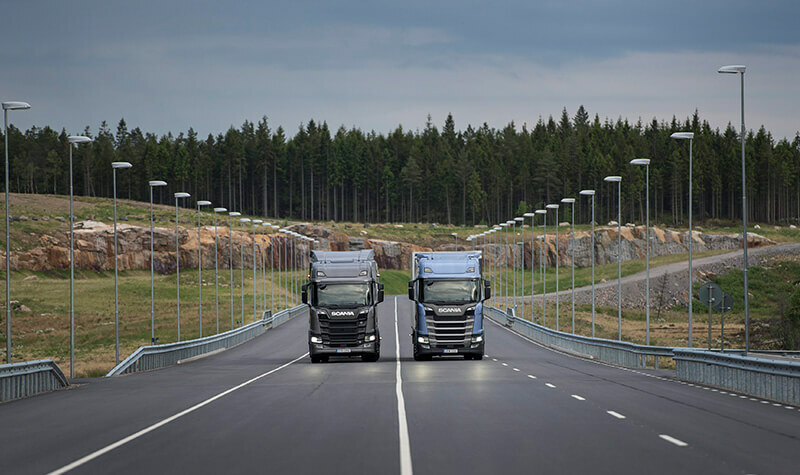 The fleet of TL Transport UAB is made up of SCANIA and MAN vehicles that meet Euro 5 and Euro 6 standards. 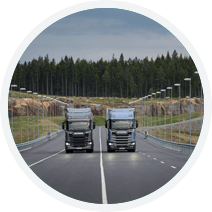 They ensure that trips are completed safely and leave a far smaller environmental footprint. In recent years, there has been an increasing concern for environmental issues. Thus experts in various fields have to come up with solutions how to contribute to environmental protection. When it comes to long-distance trips, environmental concerns acquire even greater significance as in this case the goal is to minimize CO2 emissions.